It’s a well-known fact that humans love hot weather. At the first hint of the sun, we dash outside to make most of the all too fleeting summer temperatures. Sunbathing, barbecues, trips out to the seaside with family and friends…the list is endless. Unlike humans, the heat isn’t good for our dogs, who are unable to sweat through their skins as we do, so they regulate their body temperatures through their noses and paw pads, and by panting to cool down. To understand how dogs suffer from heatstroke, just imagine yourself wearing a thick winter coat in the heat of the summer sun. Symptoms of heatstroke in canines include dribbling, excessive panting and even collapse. You may think you are doing your pooch a favour when you bundle him into a hot, stuffy car at the start of a marathon journey up the motorway. Then leave him in the car whilst you traipse around the shops for hours upon end. The reality is very different for your poor dog. In hot weather the temperature rises in the car turning it into a mini blast furnace. 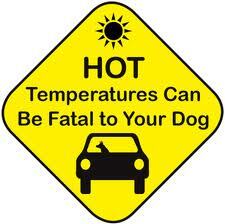 Your dog is unable to cope with this sudden increase in temperature and overheats as a result. He starts panting to try to cool himself down but this is not enough, leading to dehydration and heatstroke. This can be fatal if left untreated. Each year, dog owners are warned about the dangers of leaving their pets in cars during the summer months and particularly if there is a heat wave. And, each year, we hear about dogs dying in overheated cars. Remember dogs cannot cool down as effectively as humans. Parking in the shade or leaving a window open does not make it safe. The message still isn’t getting through. The hot weather is dangerous even fatal for dogs. Please leave your dog at home during spells of extreme heat. Overheating doesn’t just occur in cars. Your dog is also at risk if left in a conservatory or another glass-sided building that becomes like an oven in hot weather. Overweight and older dogs; those with a medical condition and breeds with a ‘squashed face’ (brachycephalic), e.g. bulldogs are all prone to overheating. They are more likely to have breathing difficulties that worsen in the heat. Don’t walk or run with your dog at midday; go first thing in the morning or the evening instead. Do take extra care if you have an overweight or older dog as they cope less well in the heat. This equally applies to ‘at-risk’ breeds. Do groom your dog to remove excess hair; that will keep him cool in hot weather. If your dog shows signs of heatstroke, then take him to a cool place; place a cold cloth on top of his head to reduce his temperature and give him plenty of water to drink. Contact your vet immediately if there is no improvement. Urgent First Aid care is essential to cool the dog’s core temperature as soon as possible, and your vet may administer a cold intravenous infusion. Serious damage to the dog’s internal organs can result when exposed to excessively high temperatures, yet you may not see signs of these problems for up to 24 hours after exposure. Play it cool this summer and your dog will love you for it. If you do see a dog in distress please contact your local police station or the RSPCA 24 hour national cruelty and advice line on 0300 1234 999.